Editing project settings in Innoslate allows you to change the name, description or folder location of an existing project. On the 'Manage Projects' page, click the 'Edit this project's preferences' button next to the project you wish to edit. This will open up the 'Edit existing project settings' dialog box, complete with a form you can use to edit your project. Enter a new name, description or folder selection. Click 'Save' to save any changes you made to your project. 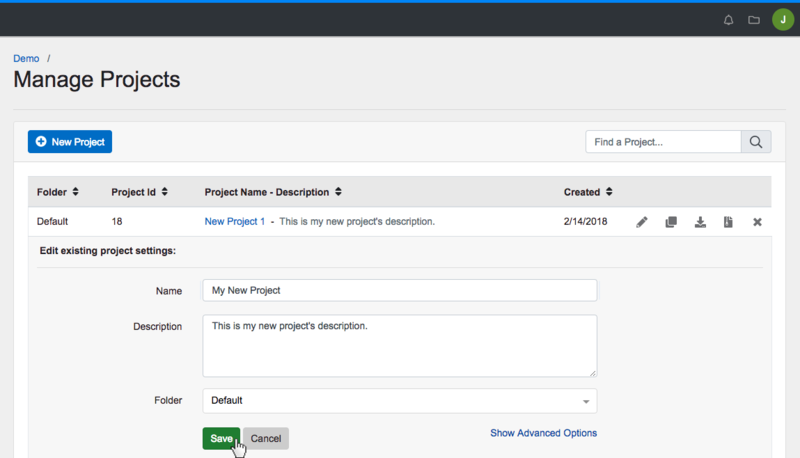 On the ‘Manage Projects‘ page, click the ‘Edit this project’s preferences’ button next to the project you wish to edit. This will open up the ‘Edit existing project settings’ dialog box, complete with a form you can use to edit your project. Enter a new name, description or folder selection. Click ‘Save’ to save any changes you made to your project.